Paige moved from her hometown of Portland, Oregon to study at The University of Montana, receiving her BFA in ceramics, in 2006. 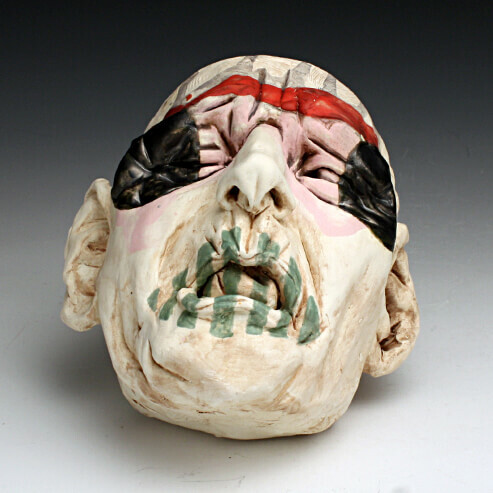 After completing a year of Post-Baccalaureate study at the University of Washington in ceramics in 2007, Paige participated in a yearlong residency at the Carbondale Clay Center in Colorado. To further expand her portfolio in preparation or graduate school Paige went back to Montana in 2008, as a long term resident at the Red lodge Clay Center. During her time in graduated school Paige was fortunate enough to live and work on site in KecskemÃ©t, Hungary at the International Ceramics Studio. In 2012, Paige received her Master of Fine Arts from Ohio University in Athens, Ohio. In the beginning of 2013 Paige will be a part of Project Network in Denmark at Guldagergaard: International Ceramic Research Center. I create objects, which are a regurgitation of my mental melting pot. The figure comes first: it is everyday, in the newspaper, in the grocery store, and in the mirror. Raised by medical professionals I have always had a persistent curiosity about the human body. I capture intense emotion through still gesture, not to tell a story but to conjure a reaction. I strive to get the most detail out of clay to satisfy my inner craftsman. It is the ultimate challenge for me to recreate the human form in a most realistic manner. To escape that possessive, stressful ball-n-chain known as realism, I free myself with spontaneous expression through surface treatment. Once I push the realism as far as I can, I let my mind and body settle, letting the work become less precious. I try to look at it more objectively. Then, when I feel it is ready, I give it a taste of what I feel it needs in that moment–some pink here or a patch of drill holes there. My decisions pile on one after the next projecting an equation truly unique to me.